Bernard Krisher, the journalist, and philanthropist who founded Cambodia’s first daily English-language newspaper died on March 5 in Tokyo. He was 87. His death was first reported by his newspaper, The Cambodia Daily, which quoted family members as attributing his death to heart failure. Krisher had a long and illustrious career as a journalist and became a well-known figure in Asian journalism, producing exclusive interviews with high-profile figures including Japanese Emperor Hirohito and Indonesian President Sukarno. He founded the Daily in 1993 following the establishment of the Phnom Penh Post a year earlier, then published fortnightly. Both newspapers came to symbolize a new optimism for a post-civil war Cambodia, one that would fade with successive crackdowns on freedom of the press and the opposition in recent years. The Daily was forced to close its print edition last year and the Post was sold to a Malaysian investor with links to the government. In Cambodia, journalists and former staff members at the Daily, along with colleagues and friends from World Assistance for Cambodia, and NGO Krisher founded bid farewell and paid their respects. A two-day Buddhist ceremony ended on Tuesday. A former senior journalist at the Daily, Vann Roeun, said Krisher wanted to train both international and Cambodian journalists and promote independent reporting. “Losing him is equal to losing the newspaper completely because of everything he built for freedom of the press and journalism training for both local and international journalists,” he said. He added that over the years the Daily faced numerous threats of closure, but until its eventual shutdown in 2017 Krisher managed to keep the paper afloat. “Despite many obstacles, his [Krisher’s] stance was stoic. He kept moving forward and never backed down. He solved problems peacefully, he did not hurry, but acted with confidence,” Roeun said. Krisher began to step back from the management of the Daily from 2016 as his health worsened, passing control of the paper to his daughter, Deborah Krisher-Steele. But Krisher-Steele’s proprietorship would be short-lived, as in 2017 the government handed the Daily a $6 million tax bill it could not pay, forcing the print edition to close. Other media outlets, including Radio Free Asia and Voice of America, were also targeted by officials. Chhorn Chansy, another former staffer, said Krisher was a problem-solver by nature. “He was a very smart person,” he said. As the government imposed the tax bill on the Daily in late 2017, Krisher said he would take “full responsibility”. “I am so sorry to know he passed away, but we will remember his good deeds for Cambodia. He knew many of our leaders, including our late King Father Norodom Sihanouk,” he added. 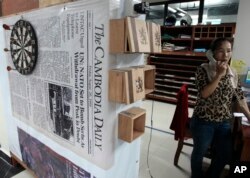 In this Sunday, Sept. 3, 2017, the first issue of The Cambodia Daily is seen at the newspaper's office, in Phnom Penh, Cambodia. Krisher met Sihanouk in 1964 when he interviewed Indonesian president Sukarno. Sihanouk then invited Krisher to visit Cambodia. Prince Sisowath Thomico, a former assistant to Sihanouk, said Krisher and Sihanouk became good friends. The king, he said, read the Daily every day. “Since 2002 or 2003, His Majesty the late King stopped reading some [other] newspapers... Therefore, he read the Cambodia Daily, every day, almost every single article in the Cambodia Daily,” he said. Elizabeth Becker, a veteran journalist who covered the Vietnam and Cambodia conflicts, said she admired Krisher. “Few foreigners have had such a permanent and positive commitment to Cambodia as Bernie. Starting a major newspaper and publishing house are difficult in any circumstances. And he kept his commitment until forced to close down the newspaper,” she said. Reporters Without Borders, the press freedom watchdog, ranks Cambodia 142 out of 180 countries it surveys. Nop Vy, media director at the Cambodian Center for Independent Media, said Krisher’s death was a great loss for Cambodia. Cheng Sokhorng, a former journalist at the Daily who now works for the Post, said: “I believe that his achievement will stay in Cambodia and remain with Cambodians and Khmer people will remember his name,” she said. Krisher’s legacy, said Becker, will be seen in the lives of the many Cambodians who learned to read English from copies of the Daily and the journalists who cut their teeth at the paper.